Review: Obol - Never Eat Soggy Cereal Again! You know how you're told to eat slowly so that you will digest better, know when you're full, etc.? Well, when it came to eating cereal and milk I was a speed eater! Why? Because I loathe mushy cereal!! I am so happy that I found a solution to this problem with Obol®! 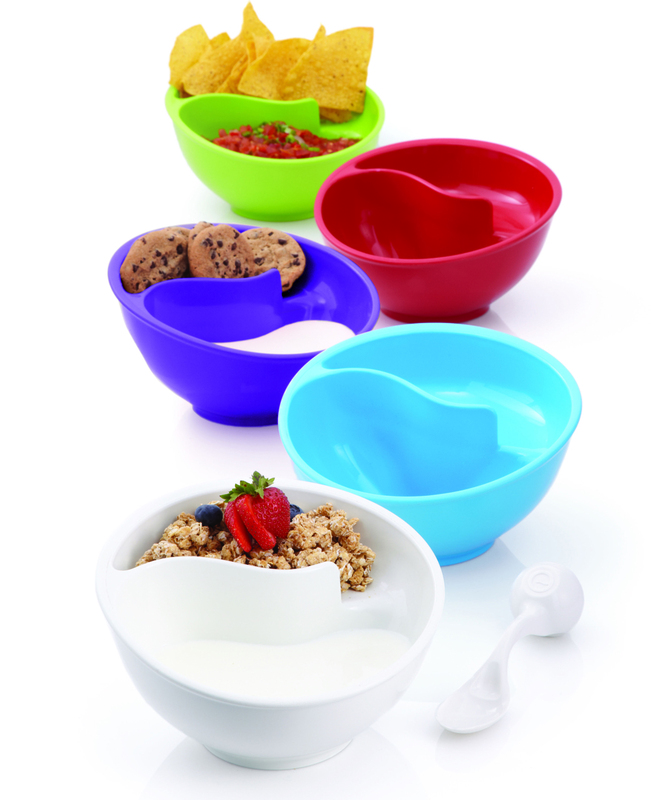 Obol® is The Original Crispy Bowl® that solves the problem of soggy cereal. With the unique Swoop n Scoop® Spiral Slide Design, the Obol makes every bite as crispy as the first bite. The easy to hold, textured non-slip grip and rim makes it easy to eat anywhere. It's perfect for eating in bed or while watching a movie. 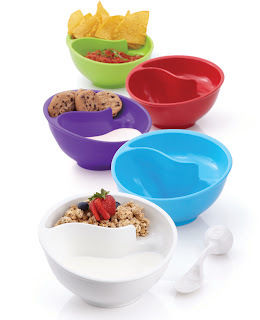 The Obol is also great for soup & crackers, milk with cookies and chips & dip. 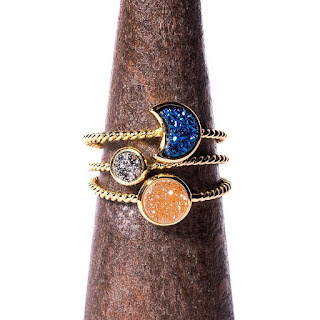 love the colors, and what a great idea! I usually eat my cereal dry with a side glass of milk because I hate soggy cereal but might have to give this a try! LOL-I love mushy cereal-but think this would solve my soup and crackers problem! Also the fact that I eat while sitting on my couch at times--love the colors!! what a great idea! I dislike soggy cereal also! love how it can be used for many different things! The only cereal I like mushy is raisin bran, so I love this idea. It's silly but it works! I want to try this so bad! My kids often don't finish their cereal and their biggest complaint is that their cereal is soggy! I had no idea this kind of product excisted! My husband hates soggy cereals and this bowl would be really great for him! Thanks for sharing! Oh yes!! Soggy cereal does not do good to my palate. Whoever invented this bowl is very imaginative. Super neat bowl :D very creative. With this bowls no more soggy cereal for sure. My husband is going to love this, he hates soggy cereal. You just made my day finally something I can get him he does not have yet. Smart and nifty cereal bowls. I don't add milk when I eat cereal. Very clever and interesting bowl, that is truly a solution of not having soggy cereals, i don't eat milk with my cereals for i always have some after eat problem. Simple yet innovative... such a nice idea for us- cereal lovers! That sounds interesting and healthy as well. I have heard of this before. It is nice to know that it actually works. What a great idea! There's a product for everything! I love this for Chips and dip. Football season is coming, chips and dip are a staple at my football parties. Such a great idea! I love the color selection as well. Those bowl look so cool! I wonder how well they stack? Saw this and was wondering how it actually worked. Thank you for the review. I hate soggy cereal as well. Will check out the site and the videos. I like the fact that it comes in different colors and it has the section to separate milk and cereal. Brilliant idea! 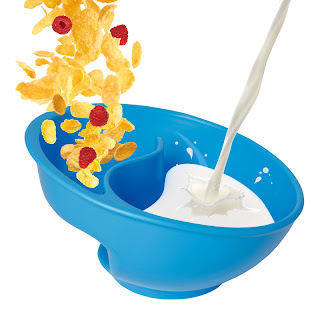 What a cool way to eat cereal! No more soggy cereal would be a great thing. I will have to look into picking up one of these bowls for myself and my daughter. I have never heard of anything like this before. This is absolutely such a great way to eat cereal and dippinng sacks! Wow. This is an absolutely brilliant idea. My son wastes a good majority of his cereal daily due to sogginess! I think this is the most ingenious thing. My daughter loves cereal too. How smart! I don't drink milk but my sis does and she's always complaining about the soggy cereal. I'm sending her a link to this - she must be informed! WOW I need this for my house. My boys stopped eating cereal for this reason. They will be thrilled to know they can enjoy their favorite cereals again without the fear of becoming soggy. Thank you so much for sharing, what a fabulous idea, I LOVE IT! What a fantastic idea!! I always leave mine too long in the bowl and they go soggy. This. Is. AWESOME! I know that I hate soggy cereal, which is why I never put milk on my cereal - I just eat it dry. I am definitely going to go check the Obol out right now! I cannot believe this is the first time I am seeing this product! It is amazing! Just looking at it has me thinking of the many ways I could use it in my daily life...but I would definitely need a bunch of them! I am in love...besides the fact that we hate soggy cereal, the idea of using it for chips and dip, soup and crackers, cookies and milk...the possibilities are endless. And the textured non-slip grip feature is wonderful also! Cool idea!, loving the colours! this is cool. i HATE soggy cereal. makes me gaggy. This is a great idea. Nothing is worse then soggy cereal. This is a perfect for me because I have always despised my cereal and milk touching. I don't get it. I understand the soggy cereal part, but I don't really get the point of separating the two because I like the cereal to at least be a little moist with milk before it hits my mouth. What a great idea, this would even be good for chips and dip! this looks pretty interesting. especially for my kiddos who take a while to finish their cereal! This would work great for my Granddaughter. That is why she doesn't put milk on her cereal... she doesn't like it mushy. Oh wow! Super interesting...I eat my cereal immediately after pouring the milk, otherwise I cannot eat it. This is such a neat idea. I hate soggy cereal! I love this and think it is pure genius! I want one in every color!! This would be perfect for chips and dip! Wow, this is an awesome idea! I bet it would be great for little kids who take a while to eat their cereal in the mornings. OMG I need this bowl in my life. Like 50 years ago. lol. My husband will definitely want one too, what a great idea. What a great idea! The colors are bright and I love that. Kids or adults, who wouldn't love this bowl. I hate soggy cereal so I LOVE this concept. I love it when people solve my problems for me! Those bowls are really neat looking! I love the bright colors and the fact that the cereal doesn't get soggy. What a great idea! I want this! I need this!! What a brillant idea! This is genius! My whole family would love these! Wonder if I can find them nearby? HA! Where has this been all my life!!!! I hate when my cereal gets soggy and full of milk so I think this is a wonderful concept. What a great bowl. I need to buy these right away.